Tbh, I already found the Anvil Throne warlord incredibly strong and now he's even better. Denying he will be really good after this expansion comes out seems ridiculous to me. I never played bloodwave, but I'm taking Zot's word for it that he wasn't as bad as so many people thought he was. I will post a card analysis later today or tomorrow. I admit that there are a ton of new cards that seem to be ... very very cost efficient. And efficiency is key, if you invest x mana, get value out of it and then your opponent has to invest x+y mana, to get rid of it (perfect example is ghoul rot or mage bane) it is a net win. And I see a lot of new potentially net-win cards on the warlords side. Since I am no playtester I never played with the new lvl 1 goblins before, but they seem to be so strong for their mana cost and with all those new, cheap buffs it appears to me that the warlord might finally become a tier2 mage. Your optimism that he suddenly gets a positive win ration against druid/necro/priestess is premature imho but I think it's unquestionable that these new cards are a huge boost for him. I know, Mage Wars player do never agree on those "rankings" but I think it is common knowledge that the Bloodwave Warlord was considered (by most) to be on of the weakest mages. So some efficient cards certainly do not offset the balance right away because he needed this. To become viable. If you compare him to other lvl 1 creatures, there are plenty of "equally" efficient creatures. And so on, and so forth. So at first glance his stats are nothing special. Buuut against other creature decks he excels if played by a Bloodwave Warlord because he can get veteran tokens and secondly those cheap formation buffs might really do something. Add the helmet for a "free" charge +1 every turn and they are at 4 dice, piercing 1. Not bad for a 5 mana trash creature. Although, for 3 mana more you could get a butcher.. And he has 4 life and "1" dice more (technically 2 but you know).. I still think the goblin is more efficient, but we will probably see a mix of both? Because the Warlord only has 9 channeling, he's probably play with barracks + at least 1 outpost, so it's 11. And using 8 of those 11 mana every turn for a butcher probably is too much because you can't properly use your other 2 actions. But well, I need to play myself to say for sure. Why only on #2 you ask? You are right, Press the Attack would be good without the Elven Soldier but Elven Soldier wouldn't be good without Press the Attack. Still, I think a strong, cheap lvl 1 creature is more valuable in general than a good buff. But this buff right here is wonderful. In most cases only costing 2 mana (because of the Ring of Commands) you basically get value out of this card even if you only use it by 1 creature. Bear Strength costs 4-5 mana and gives you +2 meele. This card costs 2-3 mana and gives you meele +1. And the opportunity to roll all attack dice again for 2/1 mana. Soo... it is already decent enough if there is only 1 soldier in the zone - but honestly - how often is that going to happen in a swarm deck? This card definitely is a key card for anyone who attempts to build a swarm Warlord. 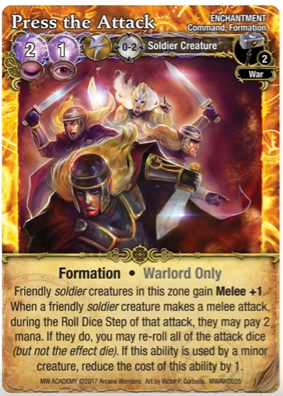 And you can use it with the Paladin and a army of "Knights of Westlock" as well.. and they have 6 dice which they can reroll then... And since the holy school lacks regular power buffs in school like Bear Strength, this is a perfect card for such a build as well. Especially because paying 2 mana to reroll a 6 dice attack is much more attractive than rerolling 3-4 dice. 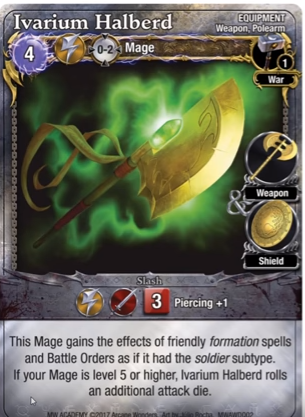 And probably the best part is, that with the new Warlord weapon the mage himself can use the effect to reroll his dice and gets an additional attack die as well. That's deadly efficient as well..
To sum it up, this card has many implications and is useful in a variety of situations and additionally is a very cost efficient card, certainly one of the best new cards! 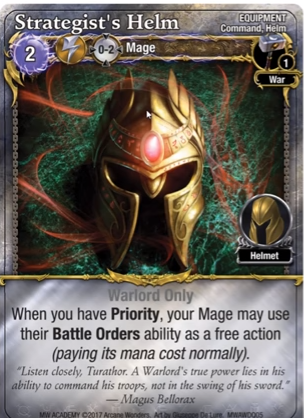 Still, my point is, that this card is super mana efficient if you consider wearing the helmet (+1 charge) and have a Press the Attack revealed in the zone. Suddenly you already have 7!! dice with piercing 1. (4+1[pta]+1[BO/charge]+1[ability]). And for 2 mana you can reroll those dice. It's best compared to Vorpal Blade which I consider to be the most efficient weapon at the moment. But this weapon is - in the right setup - even stronger/more efficient. Okay, now the drawback - the reason why it is so comparatively cheap - it's a double handed weapon. Pretty big disadvantage (no Elemental Wand to throw a stone every turn) but I think this weapon suits the Warlord better anyway. He was designed to fight in the front lines (meele +1 inherently and 36 life..) and it was strange to have this Warlord equipped with a Mage Wand in the one hand and an Elemental Wand in the other. That just never really fit. So I think this card is more balanced than the other 2 but still a strong card because it fits the theme perfectly. 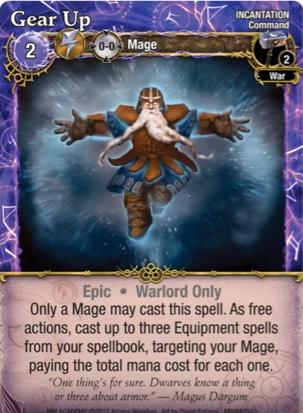 This card is another thematically good card and I think a very important one as well for the "way to play" the new Warlord. Because you just cannot afford to play the barracks and a Battleforge. It slows you down, you need to press the attack and not stand in the corner, starting to mediate to get the mana for all your spawnpoints (you see what I did there? :p). All those new stuff.. the helmet, the weapon and the Breeches want to be equipped but you only need it once the fight actually starts. So it really makes a difference when you have to cast this equipment. If you have to cast equipment right from the start, you severely limit your options because it drains a lot of mana (BF  + 1-3 mana additionally every turn). In the best case you get your creatures out at fast as possible and the moment you have enough you sprint into meele and then you equip yourself, that way you have used your mana more efficient since the alternative would be that you had your equipment from the start but 1-3 creatures wouldn't be on the battlefield yet or they would but not ready to fight yet. I hope I could express why this card is so good for the swarm Warlord. Well. I think this card is pretty strong and might make a ranged-build finally viable. I wonder if you can use Battle Orders twice in the same zone and turn? Once from Gurmash and once from the Warlord himself? Should be possible.. And if it is, that might be another strategy, maybe playing with Gurmash instead of barracks..? Or maybe with both? Though, both might be too slow..? Well, it's an interesting card which might allow for developing whole new strategies. Uh press the attack is warlord only. Did you forget the falcon as being on of the level one creatures? I also think the hallbard has some serious juice. You didn't seem to talk at all about the abilities it has. Enti I'll completely agree discussion is most welcome, let's all be careful with our word use however...you too Red though I'm glad to see you back. I honestly do believe the Anvil Throne is capable of taking on anyone after this. I refuse to use the tier system of ranking but you'll see him win some popular events at least. I agree. Anvil Throne was already an extremely good mage. Now he's even better. I'm glad to see the warlords getting love. The arcane restriction always really hurt them, but cards like the harshforge golem should help that A LOT. I also personally really like the new troll. 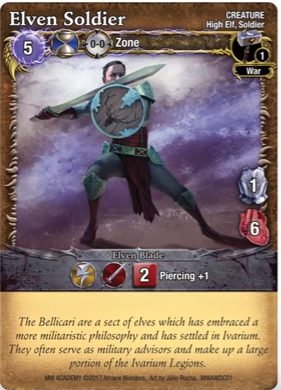 The new cards are far better / more fitting for the Bloodwave Warlord. Not convinced that the Anvil Throne is really getting a (significant) boost. I'd still prefer to play him with BF and 2 wands and protecting the wands with the gloves and without the barracks. The Bloodwave on the other hand... Excited to test it. But the FM isn't even available on OCTGN yet, so we probably have to wait quite a bit... Still, looking forward to it! Well the main obvious advantage the dwarf is getting is Fast whenever he wants it. While not discounting that, the +1 Armor and Tough - 2 he can pick up as well. That's not negligible at all. One thing I've been wanting to try is my "Don't Care Warlord" build. Basically I put on Chitin Armor with the protection rune along with the new pants and some leather boots. I now have 5 armor. Putting on the helm, halberd, and Veteran Belt I am very unlikely to suffer much corrosion when an Acid Ball would need a 6- 8 twice. Yes it'll take build up and I'll need a creature or two before I completely get dressed but there are....other benefits yet to be revealed that synergize with the build up. Well, equipping both rings + cloak might even be decent, when I think about it since that is comparable to getting additional channeling. But why would you equip a weapon and the helmet in t1? Just curious about the strategy behind it. @silver: Criticizing is such a negative word. Discussing fits better and this thread is especially made for discussions about the new cards, isn't it? For free Fast. My 10 second thought was that a rush mage would love to end round 1 with 4 items equipped and positioned at NC starting round 2 with initiative and 15 mana, again with the option of free Fast. I'm 100% sure there are at least 15 better uses of Gear Up. This was simply something that came to mind when I saw the video that is predictable (eg doesn't depend on what your opponent does or what creatures are out or face-down enchantments to worry about, etc) and can't be countered (because it's at the end of round 1). Double-move + Armor Ward might be a better opening, saving Gear Up for a round 2 engagement with more mana = more options = more optimal equipment. Using the tier system of ranking to describe matchups for specific kinds of spellbooks *might* make sense. But generalizing it to entire mage classes is just plain wrong because of the spellpoint system. As I have explained elsewhere on these forums, the presence of a spell point system shunts most imbalances from gameplay to deck design. That's why before his errata the wizard didn't seem conventionaly OP even as he massively overcentralized the metagame. I think the tier system makes sense and secondly I think the actual ranking inside the system is also correct. It's not about individual matchups, that would make is far too .... murky? It's about their overall powerlevel. And Necro, Druid and Priestess are - generally speaking - stronger than the other mages. Generally. In general. Same with Siren and Bloodwave Warlord. They are - overall speaking - weaker than the other mages. That does not mean that Tier2 Mages don't have a chance against Tier1 - far from it. It just means that Tier1 is generally favored if playing against a lower tier mage. Back to the Warlord: I think the new changes catapulted him into Tier2. Now only the Siren is lacking behind. But I guess we have to wait and see, if the warlord really performs as expected. i think the bw warlord is a strong mage. not top shelf, but certainly not the bottom as you suggest. the new stuff definitely improves him too. i am still considering playing bw warlord for gen con. The Bloodwave really isn't that bad. People smash on the priest all the time. The priest is really good. Just like the Bloodwave. i think the bw warlord is a strong mage. not top shelf, but certainly not the bottom as you suggest. Seriously. What can I do to convince you, that BW Warlord is the weakest mage (together with Siren)? I am not even sure, if the Warlord CAN win at all against druid/necro/priestess, even with enormous luck and constantly rolling above average. Well, I am online on OCTGN and if I lose 1 out of 5 matches with tier1 against tier3 I might reconsider my position. But honestly, I don't see it happening. The tier1 advantage really exists, it's not something I made up to be edgy in a forum. i think druid and priestess are both tier two in a timed event.